When engines are being shipped, they need to be protected so that they are not damaged. 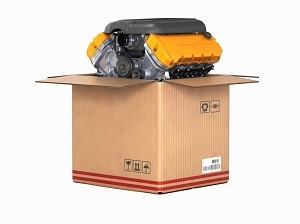 If you do not put your engine in the right crate, then the slightest bump or jolt can harm it while it is journeying from point A. to point B.
Luckily there are many great engine shipping crates and engine shipping containers. Engines are most commonly stored in plastic or foil envelopes/containers when they are being shipped. These containers are typically packed in a wooden crate or a pressurized metal container after the engines are put into them. Scribner Plastics is one of the companies that offers engine shipping crates and containers for sale. This company has engine shipping crates available for all different sizes. Google online, no matter whether you are looking for a motorcycle engine shipping crate or a lawnmower engine shipping crate, you will find a site selling a container that will most likely be able to accommodate you. There are a number of different engine cases that you can choose when you are shipping an engine. For example, Scribner offers a 5108 V-8 Small Block Container, a 5115 Big Block Container, a 5116 V-8 Small Block Container, a 5110 Small Block Container with "Bell Housing,” a 5111 Ultra Large Container, and many more. All of these engine shipping crate plastic boxes are designed to protect your engine for its voyage. However, the exact engine shipping case, or engine shipping box that is best for your engine(s) depends heavily on a number of factors related to your engine. Here is a closer look at these factors. Obviously, the size of your engine is going to heavily impact the case that you need to get. You want the engine shipping crate to be a perfect match for your engine so that it can provide optimal protection. If the case is too small, the engine won’t fit inside of it, and if it is too large, then the engine could roll around inside it, causing damage during the trip. The material that is used for your engine shipping container is also highly relevant. The most popular material for engine shipping crates for sale is durable plastic. This is the material favored by companies who provide plastic engine crates for shipping. Cost is a relevant factor when you are trying to figure out how to crate an engine for shipping. Before you move forward with your decision, you should first identify what your budget is for your shipping costs. Then, you should only select an engine shipping crate which falls within this budget. You definitely do not want to lose these records when you are shipping the engine. So, to prevent that from happening, make sure that you include the records for the engine inside of the box when you are shipping it. This will help to eliminate confusion. All liquids, including water, should be drained from the engine before you ship it. This is to prevent the engine from accumulating damage, and to prevent you from facing additional shipping charges. Dry engines preserve better and ship safer than engines with fluids in them.